Emmanuel Adebayor has said that he intends to put a turbulent 12 months behind him after completing his move to Real Madrid from Manchester City. The striker, 26, has joined Real on loan until the end of the season, after falling out of favour at Eastlands. He retired from international football in April after a terrorist attack on the Togo team bus during the African Nations Cup in Angola last January. "Today all those kinds of things are behind me," said Adebayor. "After Arsenal, when I went to Man City, don't get me wrong, it's true that I had an up and down time, and I was nearly dead as well on the way to the African Nations Cup. "I was a little bit traumatised by all those kinds of things and it was a very difficult moment for me. Last year started very badly, but 2011 started very well by signing a contract with Real Madrid. "Hopefully there's a lot of good coming my way, so I have to praise God that I'm still alive and I get the chance to wear the white shirt of Real Madrid. "I'm very honoured and very, very happy to join this club. And for all that has happened over the last six months today I'm more comfortable, more relieved and I'm very happy." Initially, Adebayor proved a big hit at Manchester City after then manager Mark Hughes paid £25m to recruit him from Arsenal 18 months ago. But Adebayor has struggled to nail down a first-team place since Hughes was sacked and replaced by former Inter Milan manager Roberto Mancini in December 2009. "I'm a footballer and what I need is to play football, to be out there on the pitch," said Adebayor, who scored 19 goals in 43 games for City. "What went wrong with Mancini and Manchester City? I don't think there's a lot of things wrong. Right now he's lost confidence in me. He doesn't have any confidence in me any more and he has decided to choose other players. "So for me I'm very happy to be back again on the football pitch with Real Madrid and the chance to play football again." At the Bernabeu, Adebayor will help cover for the loss of Argentine striker Gonzalo Higuain, who was recently ruled out for up to four months after undergoing back surgery, leaving coach Jose Mourinho with Karim Benzema as his only senior striker. 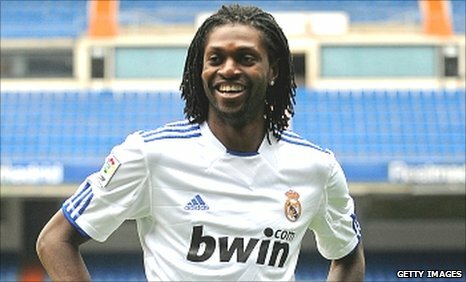 Adebayor has stated that the initial loan move should give him a chance to impress Real, who have the option to buy the striker in the summer. "At the moment I'm here for six months and I'm very honoured, and happy and grateful to wear the Real Madrid shirt," he added. "The most important thing for me is to enjoy myself here and everybody is making me feel at home. I'm going to talk to the boss [Mourinho] to see how I can help the team win things. "I'm a player who loves challenges, and who came here to achieve a lot. It's not going to be easy but I'm here to help the team achieve things. "I'm here to learn. Players never stop learning. I will learn and from then I will have to improve my game. I have to score goals, I have to create goals, I have to make things happen. "I have to pay back all the people who have confidence in me by playing well on the pitch. Football isn't just about scoring goals - it's about attitude and what you can achieve and how you can help your team win games." Real are second in La Liga with 51 points from 20 games, four points behind league leaders Barcelona.